HONDA is to mark the 40th anniversary of the Monkey bike by creating an up-to-date version of one of the strangest and best-loved machines ever made. In standard form, the bike should be capable of more than 30mph - not fast, but still a scary proposition on a machine smaller than a child's bicycle. One of the main selling points of the original was that it was road-legal, but could easily be picked up and carried in the boot of a car. The new machine should be just as practical. Like its classic forerunner, the bike will feature an air-cooled, single-cylinder motor. 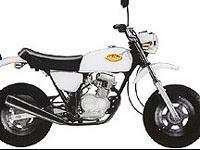 It will be pinched from Honda's XR80 kids' motocrosser. While the standard motor makes about 8bhp, several companies which already make superchargers and turbo kits for the original Monkey bike are likely to extend their expertise to the new version. Even the 1960s Monkey - which had a 50cc motor as standard - can be tuned to produce more than 20bhp and top 80mph. Honda will be aiming to keep the bike light - which will only encourage those who want to squeeze as much power out of it as possible. The new machine will have almost identical styling to the original Monkey. That means a simple tubular steel frame, small cast-alloy wheels with chunky tyres and minimal bodywork. The speedo - the bike's only instrument - will be mounted on the headlight assembly, and parts like the bars will fold away to make it easier to stick in the back of a car. One change from the original is a switch from twin rear shocks to a monoshock set-up, which will improve the bike's "interesting" handling and bring down its weight, too. Front suspension will still use simple right-way-up forks with no adjustments. The Monkey is unlikely to be sold through official Honda dealers in the UK, but several specialists who already import originals - as well as replicas by Chinese firm Jincheng - are almost certain to bring them into the country. Nick Brown, from Hampshire-based Monkey specialist AJS Motorcycles, said: "If Honda makes a new Monkey we'll probably bring them in. "There is a demand in the UK - we have sold more than 100 in the last couple of years, although most are the Jincheng bikes, which are less than half the price of the Hondas. "We also sell a lot of tuning parts - particularly big-bore kits and larger replacement engines." An original Monkey costs around £1800 in the UK, and the new machine will have a similar price tag. A Chinese copy can be yours for £899.